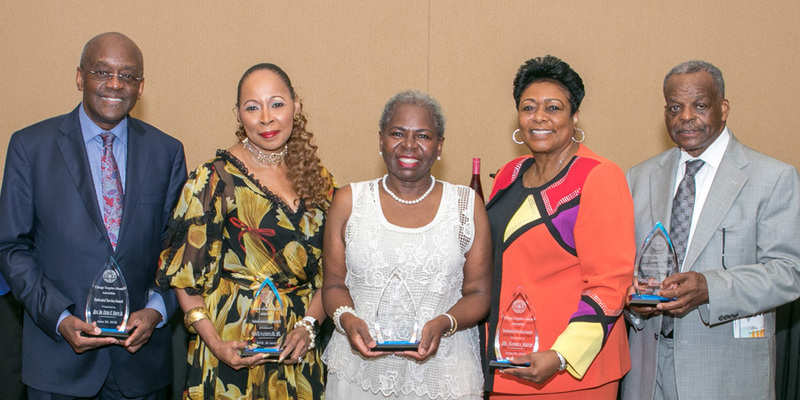 The Chicago Tougaloo Alumni Chapter held its annual 2018 Honors Brunch on June 30, 2018, at the Hilton Oak Lawn in Oak Lawn, Illinois. This year’s theme was “Tell them We are Rising” in tribute to our HBCUs. This year’s celebration was unique to our own institution as we prepare to celebrate our 150 years of being unapologetically empowering, by educating and producing gifted professionals across the world. This year’s Honors Brunch was chaired by Mrs. Latoya Fountain Washington ‘08, Vice-President of the Chicago Chapter and our Master of Ceremonies was Mr. Michael K. Harris, Jr. ‘17. We were honored to have Ms. Doris Bridgeman who represented President Beverly Wade Hogan and Carlos D. Smith ‘05 President of TCNAA. Mr. Willie L. Lewis, Jr.‘72 President of the chapter opened the event by reminding the audience of “from whence we have come” as one of the few HBCU institutions that was founded on a plantation to one of the premiere HBCU institutions in the nation. Our honorees were selected because they embody the attributes of service, dedication, excellence and what Tougaloo represents as an institution. Dr. Blondean Davis, presented by Mrs. Joyce Small Delk ‘72. Dr. Davis is the newly elected Trustee of Tougaloo College and is recognized for her vision and leadership in raising student achievement levels and in the reform of education. Dr. Davis was Chief of Schools and Regions of the Chicago Public Schools. She is Superintendent of District 162 and CEO of Southland College Prep. Mr. Solomon Gibbs, presented by Ms. Addie Hudson ‘70. Mr. Gibbs’59 is a graduate of Tougaloo College. Mr. Gibbs is a veteran having served in Germany and in the Cuban Missile Crisis. He answered his true calling by joining the Chicago public schools in 1969, and after 28 years retired as a principal in 2013. Mr. Gibbs is actively involved in Kappa Alpha Psi Fraternity. leader, teacher, virtuoso, maestro, scholar, theologian, professor, revivalist, activist, entrepreneur, counselor, friend and pastor. In 1996, he accepted God’s call to pastor Covenant United Church of Christ, which has become one of the largest churches in the United Church of Christ with over 3,000 members. Rev. Dr. Smith is a member of Omega Psi Phi Fraternity, Inc.
Dr. Sandra Smith has thirty-five years in the field of education and was formerly the principal of Hyde Park Academy High School located in Chicago, Illinois. She is President and CEO of Rhema Word Ministries, Inc. and Director of Sunday Morning Bible Study at the Apostolic Church of God. She is an ordained minister and an Associate Minister at Apostolic Church of God. Dr. Dianna Grant-Burke, presented by Mr. Willie L. Lewis, Jr ’72. Dr. Diana Grant is an American Board of Family Medicine-certified physician and an executive leader certified by the American Board of Quality Assurance and Utilization Professionals in quality improvement, compliance and strategic planning. She brings more than 40 years experience in medicine and executive leadership in health care to Next Level Health as Chief Medical Officer. Dr. Grant-Burke earned a bachelor of science in biology from Tougaloo College and a doctorate in medicine from Rosalind Franklin University’s Chicago Medical School. She is a member of Zeta Phi Beta Sorority, Inc.
We are honored to recognize these individuals for their outstanding service to humanity.